10 of the Best Men's Rain Jackets | muted. Whether you’re venturing out for a hike, dashing between shops, climbing or fishing, getting wet in the rain is not much fun. A good rain jacket will keep you dry and protected while also being breathable and versatile too. Here’s a list of 10 of the Best Men’s Rain Jackets ($75-$579), suitable for a range of different activities. 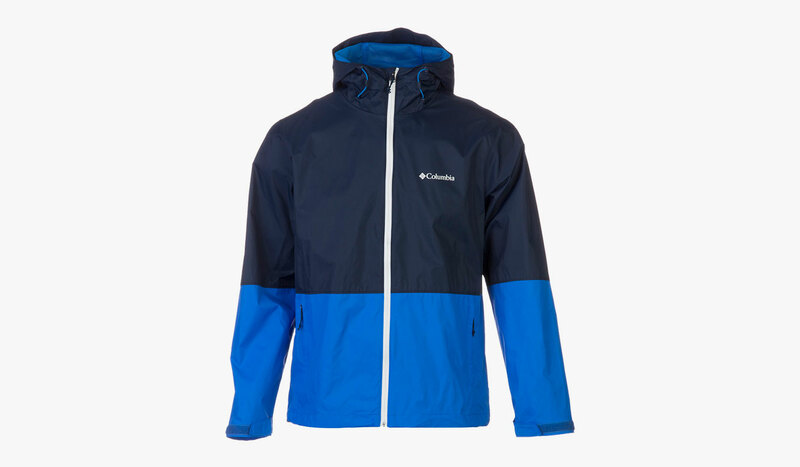 Offered in a flattering yet practical slate blue, the Freeman Channel Men’s Rain Jacket ($289)is an interpretation of the ever-popular Harrington style by Barracuda. The outer fabric is made from cotton nylon and treated with a DWR finish to provide a piece of outerwear which looks good but can be worn in the rain too. Made in Seattle, the overall style is simple yet stylish and guaranteed to appeal to men looking for a modern version of a classic rain jacket. 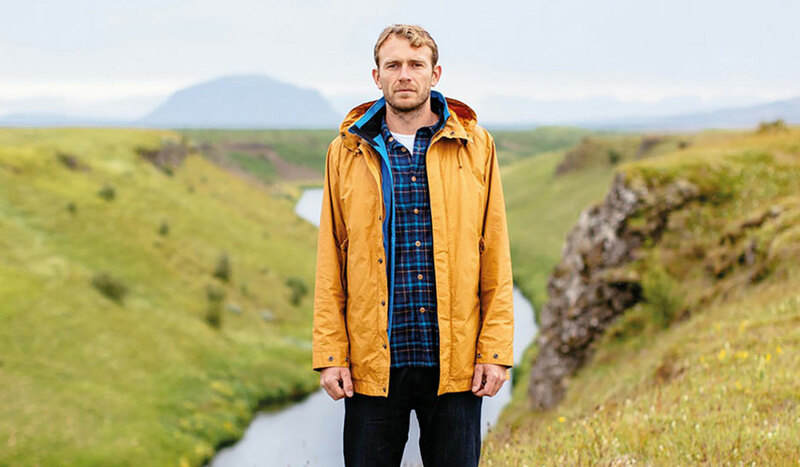 The Koppen Mac by Finisterre Men’s Rain Jacket ($269) is almost a classic raincoat but when you look at what’s on offer, there’s much more besides. The simple design is elegance and very reminiscent of a traditional rain mac, but with a brushed cotton inner for softness and comfort. It also has a shower resistant outer and accessories such as gun-metal poppers and toggles, making it an entirely different beast. Smart, convenient and snug to wear, you’ll feel great striding through the puddles with this jacket on your back. A rain jacket from the more exclusive end of the market, the Arc’teryx Theta AR Men’s Rain Jacket ($579) has some features that more than justify the price. With a trustworthy Gore-tex outer, you’ll be sheltered from the rain and the wind but your core won’t overheat because the fabric is breathable too. A fully adjustable Drop Hood provides the ultimate speedy protection for the head, complete with a tall collar so that no part is exposed. A slim design with adjustable drawcords at the waist and wrists, you’ll be completely protected from the elements with this longer line jacket. 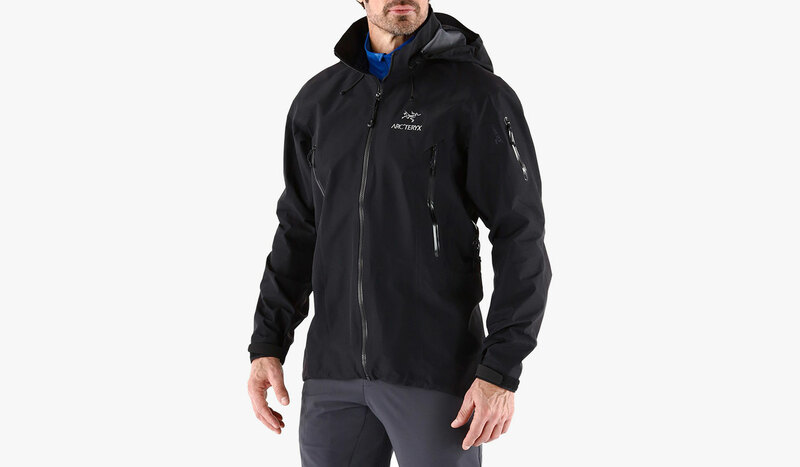 For the man who wants to stay dry in the rain without sacrificing style, the Hurricane Jacket by Sierra Designs Men’s Rain Jacket ($99) is a good choice. A hood that provides protection in the wet is guaranteed to lie flatly under a pack while the body is fully lined, and the collar brushed for optimum comfort. 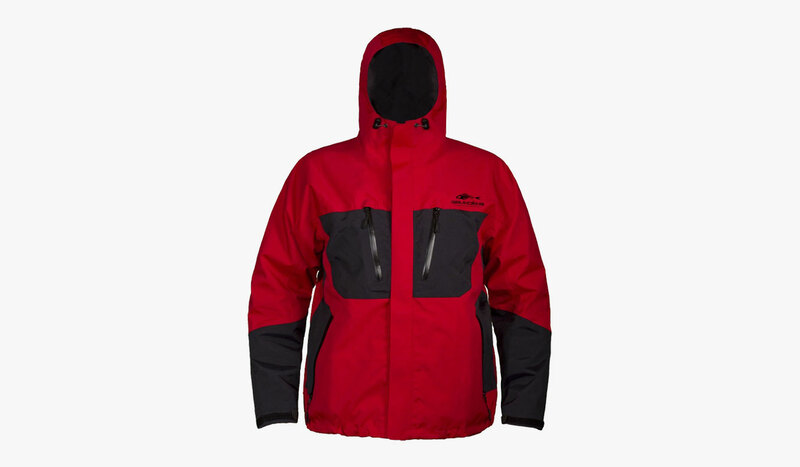 This jacket scores highly on the scale of waterproofing while vents ensure that you don’t overheat. The regular cut means that it can easily accommodate base layers while the adjustable cuffs and waistline allows you to tailor it to fit your specific dimensions. With fully taped seams and Hydroplus nylon material, the Columbia Roan Mountain Men’s Rain Jacket ($130) is made for bad weather. Don’t let a rain cloud or two ruin your plans with this modern design. Entirely waterproof but lightweight too you can keep out the water with the help of the drawstring cord at the hem and adjustable tabs on the cuffs. You can pull in the hood too for an entirely watertight style. And just as an added bonus, when it comes to packing it away, the jacket scrunches down into a tiny hand pocket size. If you plan on getting seriously wet, the Frogg Toggs Men’s Pilot Guide Rain Jacket ($150) will help keep you dry even in the most severe of conditions. Made from submersible wader material that offers sealed seams, the three layers provide breathable protection even in the most extreme of weathers. A concealable and adjustable hood ensures that your head will stay dry plus D-rings allow you to attach your equipment and kit to your jacket. 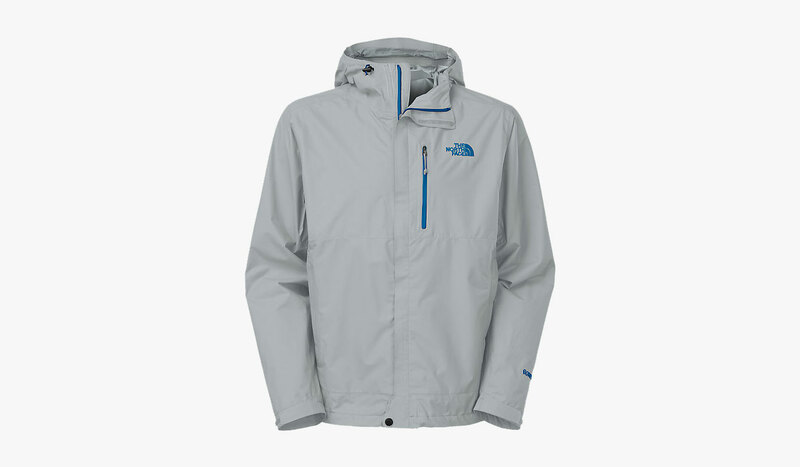 Offered by one of the leading manufacturers in the market, the Dryzzle Men’s Rain Jacket by The North Face ($199) is a stylish choice that doesn’t compromise on performance. Featuring a Gore-Tex PacLite outer shell and with sealed seams, the Dryzzle Jacket is entirely waterproof as well as breathable. With zipped vents, snap closure with a storm flap and an adjustable hood, your jacket will be completely impenetrable by the elements so you can head off for new adventures whatever the weather. This rain jacket isn’t just for light showers; it can handle whatever the elements choose to fling at you. Whether you’re on a boat, caught in a storm or a flash downpour, the Grundens Men’s Burning Daylight Full Zip Rain Jacket ($185) will keep you warm and dry, no matter what. With a heavy duty waterproof shell, the seams are fully taped for the ultimately impenetrable skin. The hood is fully adjustable and in three pieces, so you’ll get proper coverage and protection, and articulated elbows mean that you won’t have any restriction in movement either. Available in sage green, red and black the Grundens Men’s Burning Daylight Full Zip Jacket is super cool as well as keeping you sheltered from the weather. 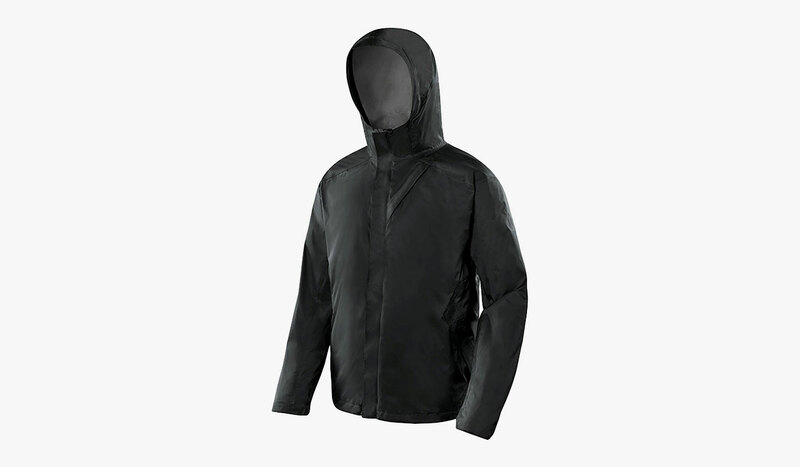 If you’re fishing, hiking on a nature trail or otherwise need to prevent the rustles and wrinkles that come with many types of outerwear, the Guide Series Men’s Storm Tech2O Dry Keeper Rain Jacket ($75) is the one for you. 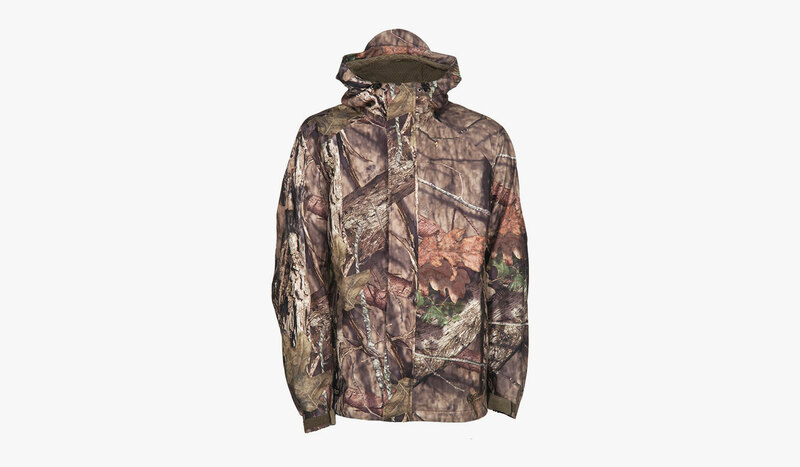 Offering almost silent movement and with a shell that repels burrs, this camouflage style rain jacket is perfect for when you don’t want to be seen. And of course, the jacket is entirely waterproof, breathable and quick-drying, plus the elbow areas have articulated seams for extra mobility and movement. 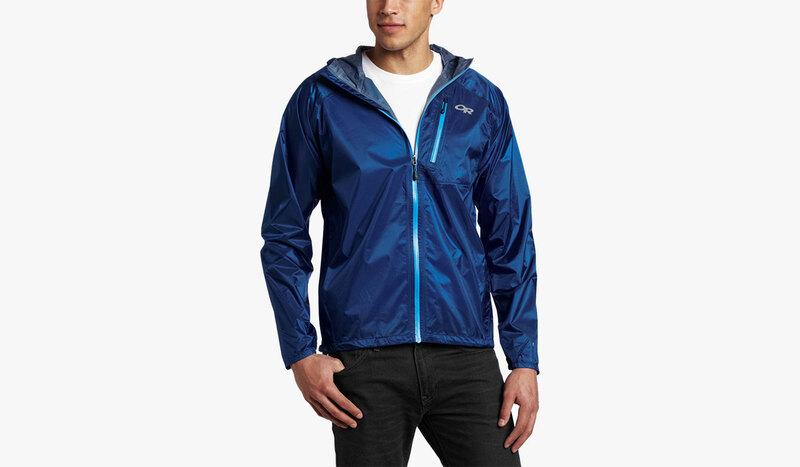 Offering protection against both the wind and the rain, the Outdoor Research Helium 2 Men’s Rain Jacket ($105) is the ideal jacket to pack just in case you need it. Extremely lightweight and packing into a small space, it’s a cinch to carry around without increasing your load. 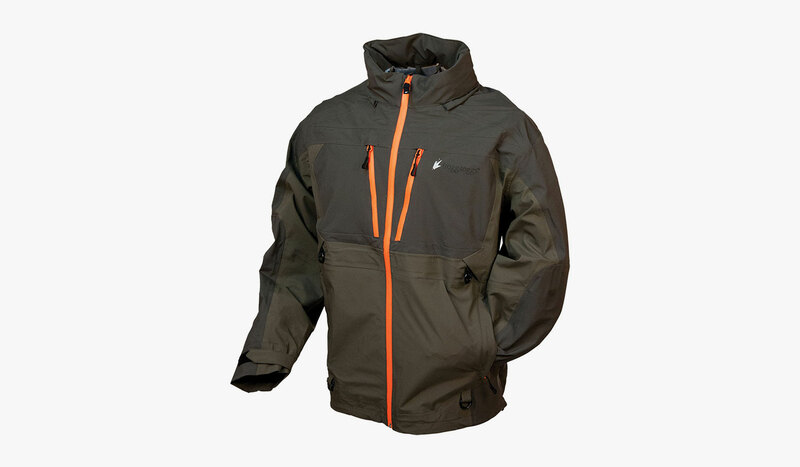 With a hood that’s compatible with helmets, making it perfect for climbing activities, the jacket is breathable and waterproof with a secure front zipper fastening.